As the name suggests, DRUMASONIC represents a high-end approach: In sampling one of the best, modern and universal sounding drum kits along with some of the finest snare drums, hihat, ride, crash, china and splash cymbals, no sound-altering devices have been employed. All the signals have been converted with high-end equipment directly after the preamps at 96 kHz, 24 bit. The goal was to provide the discerning musician, sound technician or producer – in the sense of authentic drum miking – a variety of phase-compatible, freely combinable and distributable signals out of two distinct recording rooms. Instead of delivering pre-defined sounds or tons of patches, DRUMASONIC addresses its focus on tonal authenticity, signal purity and mixing flexibility. ►A modern drum set and some of the finest cymbals, pristinely recorded in two distinct, punchy sounding rooms – Damped Room and Large Room. ►Unprocessed signals which have been extensively phase-optimized, perfectly cut and velocity-mapped with additionally developed software tools. ►Microphones: 5.0 Surround, Overheads A/B, Room M/S, Trash, Close mics, Bass Drum inside/outside, Snare Drum top/bottom – freely mixable and routable. ►Comprehensive Snare resonance and HiHat concepts, freely assignable Mapping, Velocity, Tuning, MIDI controllers. 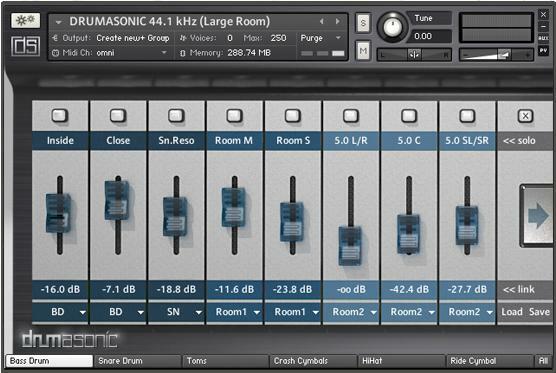 ►High performance, state-of-the-art KONTAKT4.2 engine, intuitive user interface. ►Mixer presets can now be saved to a file or loaded from a file, within each room. ►New “Random Velocity” control for randomly adding or subtracting values to or from the current velocity value within a user-definable range. ►Six new “Random Pitch” controls for randomly pitching up or down any instrument within a user-definable range. ►New mapping functionality: up to eight keys can now be assigned to each articulation (instead of one). There are mapping presets for various e-drums systems. User presets can now be saved to a file and can be exchanged between both rooms. ►Extended HiHat triggering control: the user can now define an individual MIDI CC value range according to each “Openness Level” for accurately controlling the openness/ sensitivity of the HiHat. ►New snare “WiresOff” triggering options: releasing or engaging the snare wires is now possible with any MIDI controller or with a customizable keyswitch. ►The “Panning” of the grouped close microphones is now adjustable according to each Crash Cymbal and each Tom. ►New “Decay” function: the volume decay time can now be shortened separately for each instrument and microphone category.